Rather than visiting loads of sites to see if anything new has been added, you can subscribe to the RSS feeds that most now produce, and have the news brought to you in one aggregated view. This latest version of pre-eminent reader NetNewsWire adds new features and tidies up niggles, but the difference between versions 2.x and 3.x is nowhere near as marked as between 1.x and 2.x. Everything that made NetNewsWire so compelling remains; smart feeds can be built to show stories matching certain criteria, you can browse through headlines and refresh subscriptions from the Dock icon, choose from view options including a three-column view suited to widescreen monitors, and AppleScript the app for more flexibility. Some things have been improved; you can now pick a folder as you add a feed, and while you can still sync your feeds to multiple computers, you can also sync clippings - individual stories that you sort into folders. Clippings folders can even be republished as fresh RSS feeds. Integration with other OS X apps has been improved; photos in feeds can be added directly to iPhoto (it's not clever enough to grab the high-res relating to a thumbnail in a Flickr feed, say), and events listed in the correct format on pages can be added to iCal. The built-in browser has been spruced up, optionally showing draggable tabs with preview icons, and all feeds can show 'cover art'-style previews. It's also Spotlight-aware, can use the Growl framework to alert you, and can be viewed full-screen. 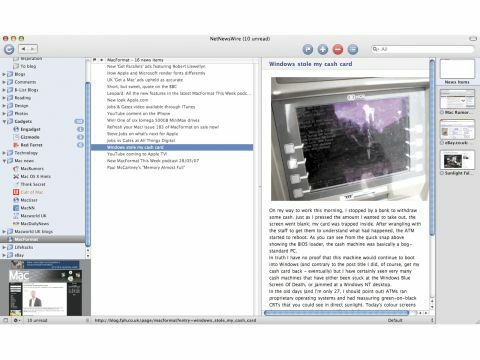 NetNewsWire is still the best RSS reader on the Mac, and its syncing capabilities - plus the option of accessing your feeds from any internet-connected computer in the world if you sync for free with Newsgator - mean it's a no-brainer if you have more than one Mac.